alexis blogs: Reflections: What Would You Be Influential About? 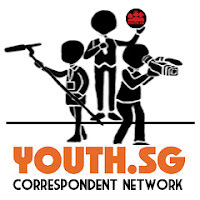 For those of you who don't follow me on Twitter/Instagram/Facebook, you might not know but I'm doing some 'mentoring' for a group of youths in upper sec/tertiary under the Youth.SG Campus Correspondents programme. The programme allows students to sign up and be part of a blogging network called Campus Correspondents. I was first approached last year because of my food blog, and I had went on to conduct several presentations and a dialogue session. This year I've decided to continue on as a mentor and we had our first session on Saturday. What inspired me to write this post was actually the dialogue topic that I had, which was on Online Influence. What I found out was the many of the youths actually look up to a diverse range of people in their lives - from their parents, to friends, to celebrity bloggers and Rihanna. I then asked them to think of what would they be influential about, if they choose ONE thing to be influential on. That's because as bloggers they will be or if not already, influencing someone in their lives. Actually it's a tough question, but we've got some surprisingly good answers about being a lifestyle influencer, being grateful, and redefining success. But that led me to the next point, which is how if one can decide, or think about what one wants to be influential about, then the next step would to think about how to make that happen. To me, that's quite a good way to think about what you want to do in your life or career after you graduate, for example. It certainly got me to reflect. So the question is, what's the one thing you want to be remembered for? What's the one thing everyone will go to you for advice on? And then, how do you plan to make that happen?